haheed Foundation Pakistan is currently serving families 1881 of martyrs across 69 cities in Pakistan with monthly disbursements amounting to Rs. 19,187,680/=As the Holy month of Ramadhan ul Mubarak draws into to a close finally after sprinkling its countless bounties and blessings , these are sombre moments to bid farewell to the Holy month ,the Shahr Allaah. May Allaah by the right of Hazrat Mohammad wa Aal-e-Mohammad [SAWW] rinse us of our sins and purify our souls ,thoughts and actions enabling us to become qualified to receive the mercy ,forgiveness and blessing of Allaah [SWT] . عَنِ الإِمَامِ الصَّادِقِ: إِنَّ مِنْ تَمَامِ الصَّوْمِ إِعْطَاءَ الزَّكَاةِ - يَعْنِي الْفِطْرَةَ - كَمَا أَنَّ الصَّلاَةَ عَلى النَّبِيّ مِنْ تَمَامِ الصَّلاَةِ، لأَِنَّهُ مَنْ صَامَ وَلَمْ يُؤَدِّ الزَّكَاةَ فَلاَ صَوْمَ لَهُ إِذَا تَرَكَهَا مُتَعَمِّداً. At the time of sunset on Eid ul Fitr night (i.e. the night preceding Eid day), whoever is adult and sane and is neither unconscious, nor poor, nor the slave of another, he should give, on his own behalf as well as on behalf of all those who are his dependents, about Three kilos per head of wheat or barley or dates or raisins or rice or millet etc. It is also sufficient if he pays the price of one of these items in cash. As per obligatory precaution, he should not give from that food which is not staple in his place, even if it be wheat, barley, dates or raisins. We must remember that the immediate benefit of Zakat of Fitra is that one shall be safe from accidental or destined death the following year. It is related from Imam Ja’far as-Sadiq (a.s.) that he told his financial secretary to pay the Zakatul Fitra of all his family members and not to overlook any of them. “What do you mean by ‘demise’?” asked the secretary. 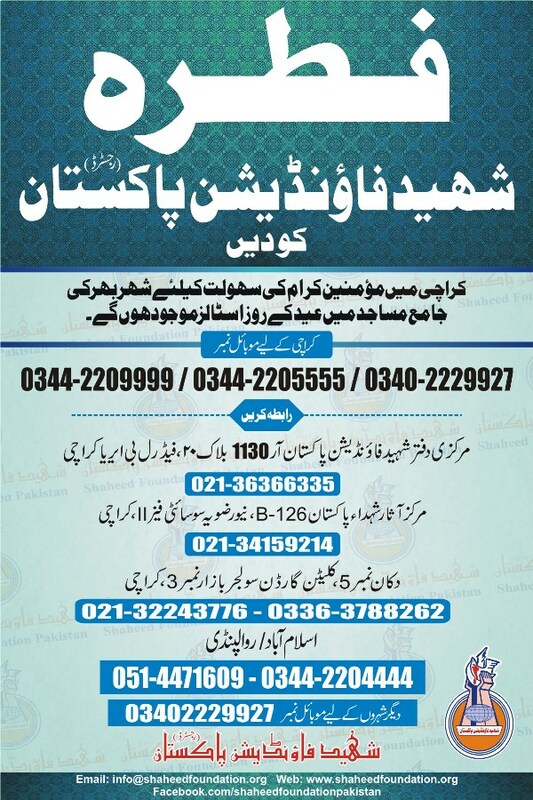 Every year Shaheed Foundation Pakistan collects Zakat-e-Fitra from Saadat and non-Sadat momineen and utilizes it accordingly for serving the martyrs families . The Fitra amounts can also be paid in person at our headoffice and branch offices. Momineen are requested to please help us spread this message to a mass audience by informing your relatives, friends and colleagues through sms ,email and social media.